When I was asked how to paint Alpha Legion in the dark style I like to do by a reader recently, I figured this would be the perfect opportunity to try it out my spray painting technique and see how it would work with a two-tone color scheme. I opted for the post heresy Alpha Legion scheme of that bluish-green color. Instead of choosing just one color, I wanted to see if I could blend the blue and the green spray paints I have on one model. I thought I could use the blue for my "shade" and the green for my "highlight." In my mind, I figured it would work because both colors are somewhat close in terms of value and it would just be a change in hue that I would end up with. I wouldn't really have highlights and shading as much as I would have color shifting. I started out by painting the whole model blue and then adding the green over that using the zenithal approach. This gave me the green on top as though it were the highlight on the armour. And here's where I changed my process slightly. Normally, when I'm done with my base colors, I go right into the shading and then work on the other parts of the model last. This time I flipped that around and blocked out all the other parts with black first. I did this so I would know where my darkest areas were. By blocking out the metals and other elements in black, I could better tell where I wanted my shading to go without making it too dark. I knew where I wanted my shading, I just didn't want it to get too dark too soon. Using my spray paint approach, I'm learning how to apply my shading selectively so that I can keep my highlights in place and not cover them up. I used to cover the whole model with a few washes and call it done. Now I've discovered that I can create highlights by being selective in where I shade. Having the black on the model before I started shading (as opposed to after like I normally do) helped me map it out. Adding the scales was going to be important. I wanted them to be there, but not overpower the model and become a focal point. I wanted them in the background of the amrour. In order to do that, I chose a blue color (GW Kantor Blue) that was slightly darker than my blue on the armour. The diagram below shows how I mapped them onto the shoulderpads and leg armour. Basically, I chose a blue that would be the same as my shadow color. That way, the lines of the scales and the final shadow color would match and blend into each other. 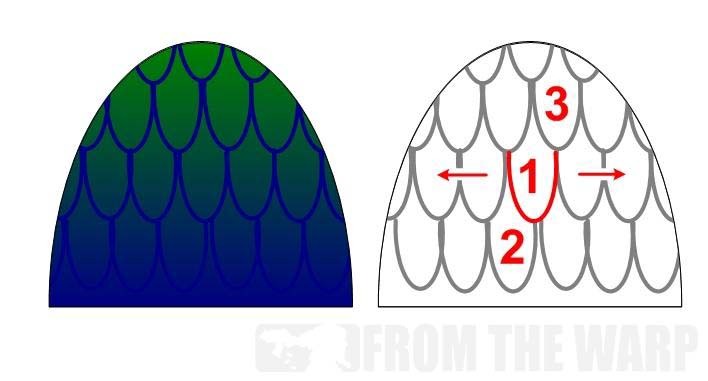 It's important to start in the middle (where it is most easily seen) when drawing scales or any design like this so that you can build from that visible central spot and all of your scales line up and are set properly. If you start off on one side, you may not have them lined up properly by the time you are in the middle of the shoulderpad where it really counts and you see them easily. I started with number 1 and worked left and right to finish that row first. The next row was number 2. All you have to do is shift your scales slightly so they attach at the bottom of the previous row. You can make your scale shape whatever you want too. Repeat this process for each additional row of scales until your surface area is filled up. Always work off that central point so all of your design is correct. There are a few different ways to paint scales, some draw them out like this, others paint in the negative space inside the scale... it comes down to what you prefer. I chose the line method like this and the slightly darker blue color so that when I shaded along the lower areas with GW Drakenhof Nightshade, the lines would disappear into the armour. The only place you'd be left seeing them is over the green and then they would fade away into the blue. Since I was keeping this guy dark, I opted to keep everything else black. Easy enough to do, I highlighted a few key spots with a dark grey color for a little bit of contrast. I didn't see may Alpha Legion models with gold, so I kept everything on this guy silver. A basecoat of GW Leadbelcher followed by a wash of Nuln Oil was all it took for those areas. The armour was given a slightly distressed look by adding a very light drybrush of GW Leadbelcher over the prominent edges that would normally see wear and tear from use and fighting. The chapter symbol was painfully freehanded in black as well and if I were doing an army of these guys, I'd opt for decals no questions asked. The design is too complex to do it justice and get it done in any reasonable amount if time. Decals would make this part of the model so much easier. You might have to make your own, but I still say it would be worth it rather than trying to paint each symbol in place. Again, knowing the base finishes off the model, I opted for the light color to contrast against the dark model and kept the colors muted here as well. I thought the slightly destroyed city scape looked appropriate for an Alpha Legion model and their covert operations. The bases are the Ruined Temple range from Secret Weapon minis. Since my green spray paint is a gloss color, I needed to get rid of the gloss by giving it a wash. I used a thinned pass of GW Biel-Tan Green to remove the gloss without darkening down the green areas overall. In addition to the blue shading, I also went in and blacklined the lower portions of the model to reinforce the shadows. I didn't do it everywhere, only the few places where the model started to go flat and I wanted things to have some dimension. It turned out great Ron! I think I'll be doing this exact approach when my Chaos bitz arrive in a few days. 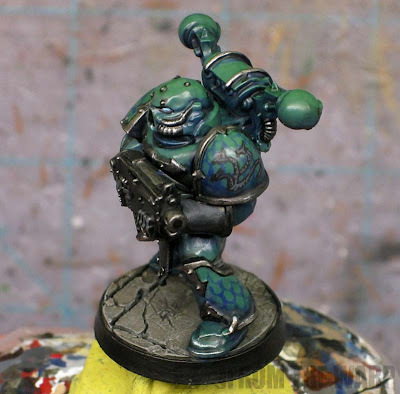 I think this style is miles above the 'regal blue, highlight with goblin green' approach I see on studio Alpha legion! The transition is really nice, but it could use a final highlight across the underside of the scales. I feel like I couldn't see those at more than a foot away. If you have trouble keeping your hands steady, try bracing your painting hand against the one holding your model; right at the heel of your palm. It's an old trick that's helped me a few times already. That blue/green looks awesome! I think that is the nicest painting style for Alpha Legion i've ever seen. Very nice. Just awesome!!! 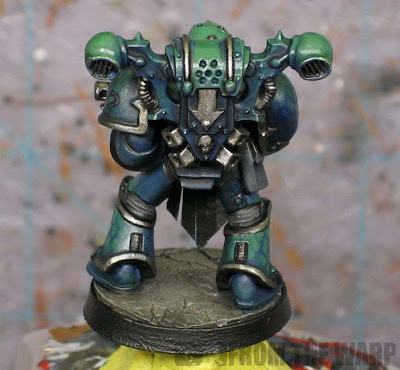 What colours did you use besides the Kantor blue for the armour? Sorry if you posted it and I am blind! That's a pretty amazing result, Ron. I'm jealous. Once you've got that down solid, whats your estimated time per section? Wow, that model looks plain awesome! 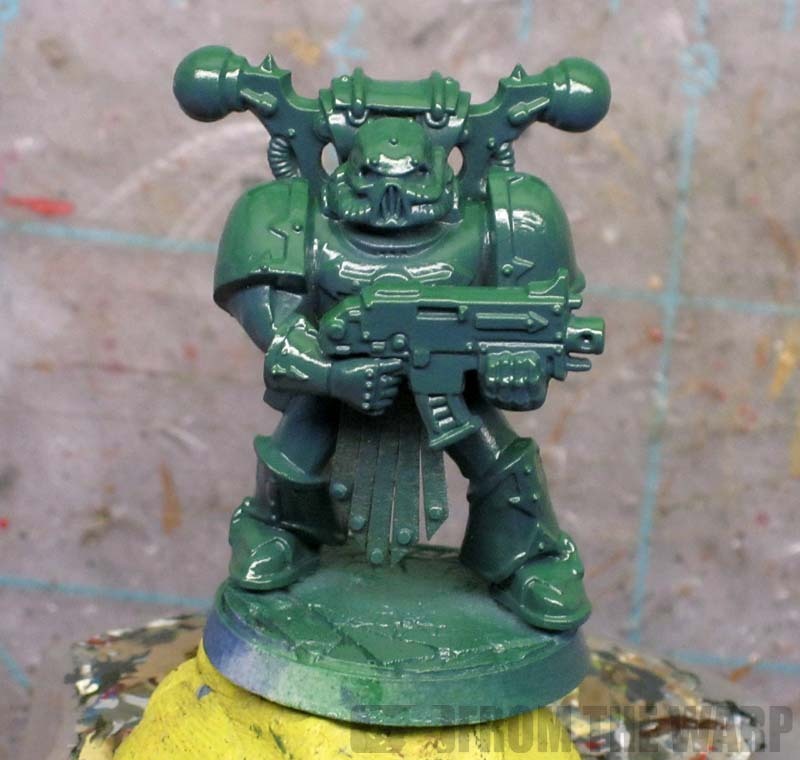 Hm, Word Bearers or Alpha Legion...? Now you've made this a really tough choice, as yours is among the best AL colour schemes I've seen yet. Every time you post something I am more and more impressed! Simple yet effective stuff. If you're having trouble getting the scales right I made a tutorial that makes them a bit easier. Zab: Stick to your plans! SC John: Thank you Sir. JW: It all depends on what effect you're shooting for. A little highlight might be just the trick to make them stand out a bit more. And you could make them blend into the background as well if that was your preference too. David: Bracing your hands and using a paint pot or spray paint cap to mount your model on while you paint it helps tremendously. That and hop off the caffeine before you sit down to paint. Black Bard: The armour is the two spray colors. The scales are lined with the Kantor Blue and the last bit is a selective wash using GW Drakenhof Nightshade along the lower shaded areas. Faolan (Jake): For the scales? They take no time at all. Maybe five minutes a whole model to line both shoulders and greaves if you drag your feet. You don't actually have to line the inside surface of the greaves since they are in shadow and the linework disappears anyway. 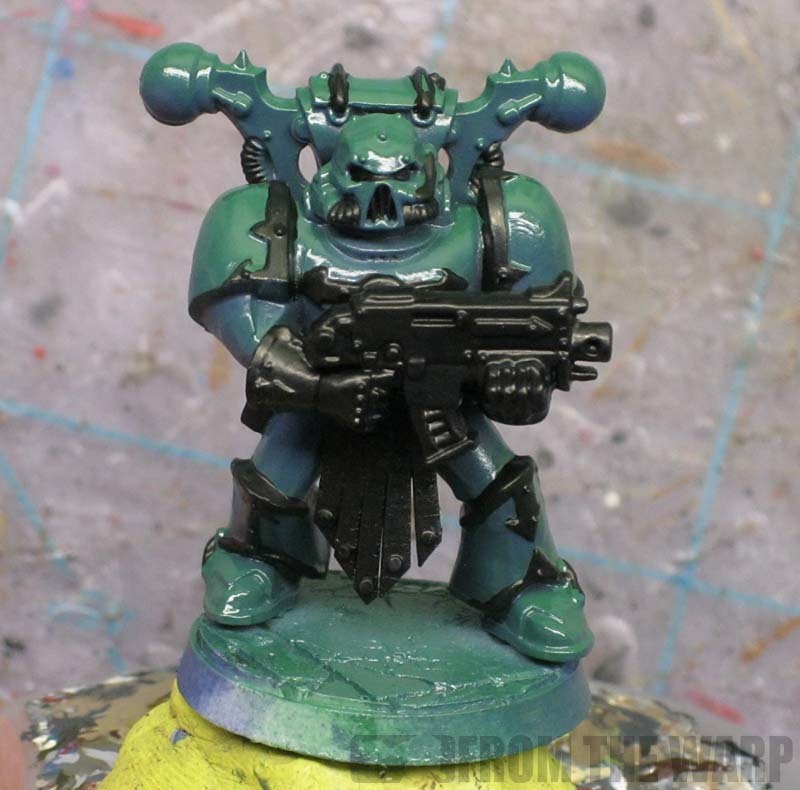 Kai: I like this color shift look as well, it's just that Alpha Legion don't call to me like other chapters do. Freakiq Toth: Excellent stuff there. Another nice and quick method to get good looking scales. Thanks for sharing the link. Definitely looks different for sure. If you dont mind me asking, what color spray paints did you use for the blue and the green? 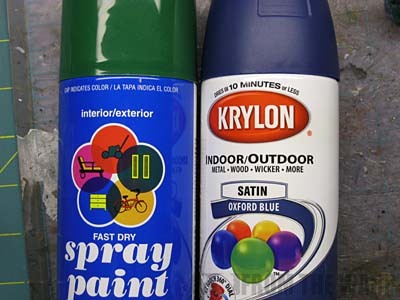 I've added a picture of the two spray paints I used in the process. I forget the exact name of the green though. 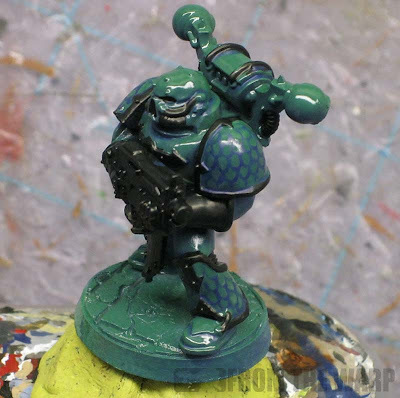 You could use any color blue and green that you wanted (especially if you had an airbrush)... the only thing you need to make sure of is that both colors are very close (if not the same) value. That's the key... making sure they are the same value so they blend together in terms of light and dark. 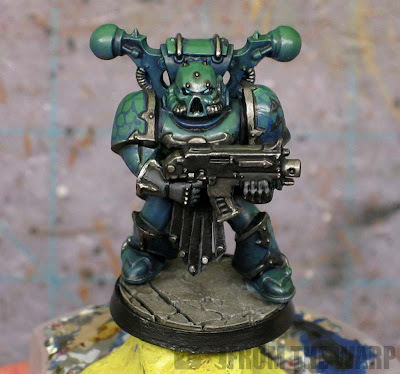 This may have swayed me from going with Night Lords and progressing with Alpha Legion instead! Always been a big supporter of people trying different styles with "official" schemes. Loving the scales by the way. Excellent, best of luck with it. Night Lords can be very cool too though so don't count them out completely. Awesome, I tried painting scales on my old Vulkan He'stan model, they looked kinder crap. May try this on my new He'stan though. Hopefully this method can get you some results you like. I'd love to see pics of the finished model too! This tutorial was just what I needed to cave and start Alpha Legionnaires (I've been wanting to, for a while)! I am totally going to give it a try. Oh, and I did refer/link to you/this tutorial on my blog post about it (at http://thechaosundecided.blogspot.nl/2012/12/the-start-of-alpha-legion.html). Thanks for sharing all your little bits of painting tips and tricks! Linn: Thanks! Glad you liked the tutorial.